You can get a custom china cabinet made the way you want it to look and have it shipped right to your home. The best part of having furniture custom made is being able to choose your own options. If you have a small space and need a piece of furniture with specific dimensions, it's usually easier to have the furniture custom built instead of trying to find furniture with those exact dimensions. 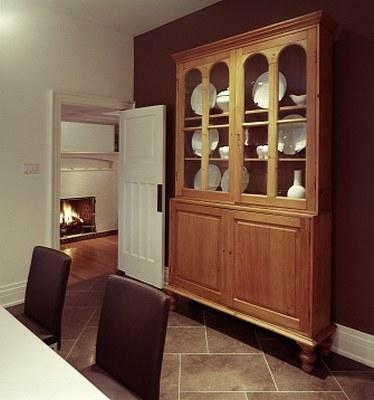 Another option you have when customizing your china cabinet is the finish. You might want to choose a particular color of stain or have it painted. You can mix and match tops and bases to create the type of china cabinet that appeals to you the most.When trying to decide what features you want your china cabinet to have, consider things like having the top of the unit open or enclosed. Would you want glass or wooden doors? You could have built-in lighting installed and felt lined drawers. You will also need to decide what kind of style you want your china cabinet to be. Do you want a rustic looking china cabinet, or do you like the look of more modern type furniture? Mission style china cabinets are very popular. If you're unfamiliar with some of the style terms used for china cabinets, you may want to browse through several websites that sell them. This will also help give you ideas and inspiration for customizing your china cabinet. Browse these companies' websites to see what custom options they offer. You can also contact them and ask any questions or address any concerns you might have. You will also want to find out what their return policy is on custom made furniture. Most custom orders are not returnable, so be certain that you know what you want -- and what you will receive -- before you place an order. Once your china cabinet is shipped to you, the first thing you should do is carefully check the furniture and the container it came in for signs of rough handling or damage. Make sure to do this while the delivery person is still there in case there is a problem with your furniture. If there is even the slightest damage, make sure you note this on the waybill. When you order custom furniture, make sure you have everything in writing. Even if you call and talk to someone on the phone, you should still send them detailed instructions in writing. You can do this by e-mail or regular mail. It is very important to have the things you want in writing so that you can refer back to it if there is any confusion or a mistake is made. Detailed instructions will also help the craftsman create the furniture the way that you want it. Be sure to include any sketches, drawings or photographs you can produce. Also remember that to have work start on a custom furniture project, you will usually be required to pay a deposit. Some companies might have a specific amount to put down while others may just want 50 percent of the total. The remaining balance is then paid once the item is ready to ship. Custom orders usually take anywhere from four to 12 weeks to complete, depending on how busy the craftsmen are. Finally, make sure you know your budget before you start shopping around for prices.